US President Barack Obama and Indian Prime Minister Narendra Modi discussed climate change and clean and renewable energy, among other things, on the day the US president arrived. But there was no major progress in the climate change front except that both the leaders hoped “for a successful Paris Conference on climate change this year”. The Paris summit scheduled to be held in December 2015 would be a landmark event where a new climate agreement is to be signed by countries. It is to be noted that ever since the US and China clinched a climate deal in November 2014, when US announced 26-28 per cent reduction in its emissions intensity against the 2005 levels (when it emissions peaked) and China announced its peaking year of 2030, there has been a mounting pressure on India to announce its peaking year as well (see Obama-Modi and climate change). However, India has maintained that it is not going to announce its peaking year anytime soon. The same position was reiterated by Modi in his dialogue with Obama. To address climate change concerns, one crucial step is the decrease the dependence on the fossil fuels. Coupled with the need to also secure its energy needs, India has been emphasising on clean and renewable energy and in this regard has laid out an ambitious renewable energy plan with specific focus on solar in the coming years. In his meeting with his US counterpart, Modi stressed, “clean and renewable energy is a personal and national priority both for Obama and myself”. In this regard, both the dignitaries discussed their ambitious national efforts and goals to increase the use of clean and renewable energy. They also agreed to “further enhance their partnership” in this area. Both the US and India are currently striving to increase the renewable share in their current energy mix. Modi also urged the US to “lead the international efforts in making renewable energy more accessible and affordable to the world”. 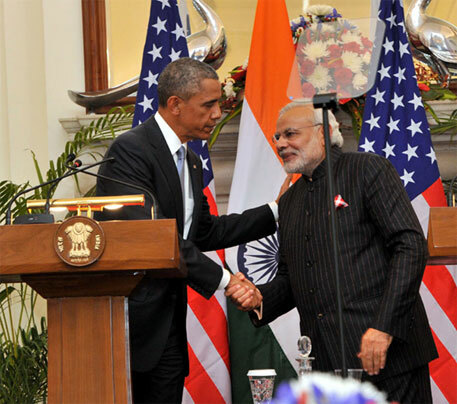 On his part, Obama promised to support “India's ambitious role for solar energy”. He said, “important steps were taken today to support clean energy and climate change”. He also stressed on the dire need to “improve the air quality in Indian cities”.